A US/Australian company has successfully tested a new 350hp electric motor on an ‘Ironbird’ ground test rig. 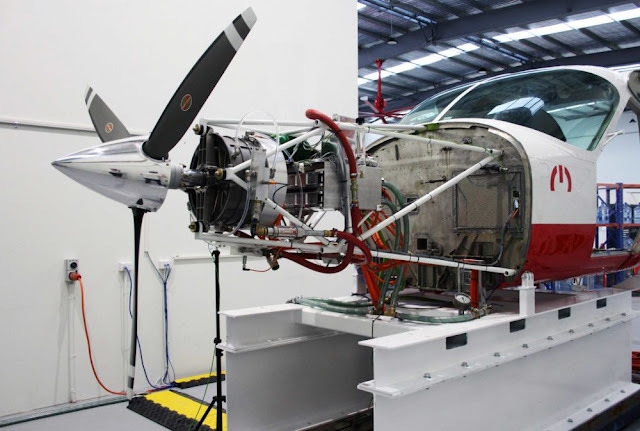 MagniX is now planning to scale up the power unit to 750hp for use on a Cessna Caravan, replacing the standard Pratt & Whitney PT6 turboprop engine. MagniX is going for an all-electric platform, saying that its 50kg motor produces 5 kilowatts of power per kilogram of weight. German rival Siemens has produced a similarly powerful unit also putting out 5kw/kg, and is aiming for 10kw/kg within two years. MagniX was founded nine years ago in Australia and recently moved its headquarters to Redmond, Washington, US. New CEO Roei Ganzarski said MagniX’s motor should cost roughly the same as the Pratt & Whitney PT6, while improving operating costs by 40% to 60% – electricity being cheaper than the Jet A1 fuel that the PT6 burns. Ganzarski says MagniX’s motor will allow loaded Caravan to fly up to 105 miles, using existing lithium-ion battery technology. That range could increase to 250 miles within a few years as battery technology improves.